Jan. 22, 2015. Late afternoon sun brightened the red-blonde bundles of lumber stacked along the fence line and the large, pale-yellow mill sheds beyond. The scent of fresh-sawn wood permeated the air. A bright red truck loaded with more lumber emerged from the shadows into that golden light, squeezing through the narrow concrete frame of the 1928 bridge that arches like a gray rainbow over the North Fork Mad River. The truck sailed around the curve past the Korbel Sawmill and continued straight toward the sun on the shiny road furred with dark trees. Then the sun dimmed behind cloud wisps. It was well past 4 p.m., and though some workers had an hour or more left on their shifts, others were done for the day and one by one drove away. 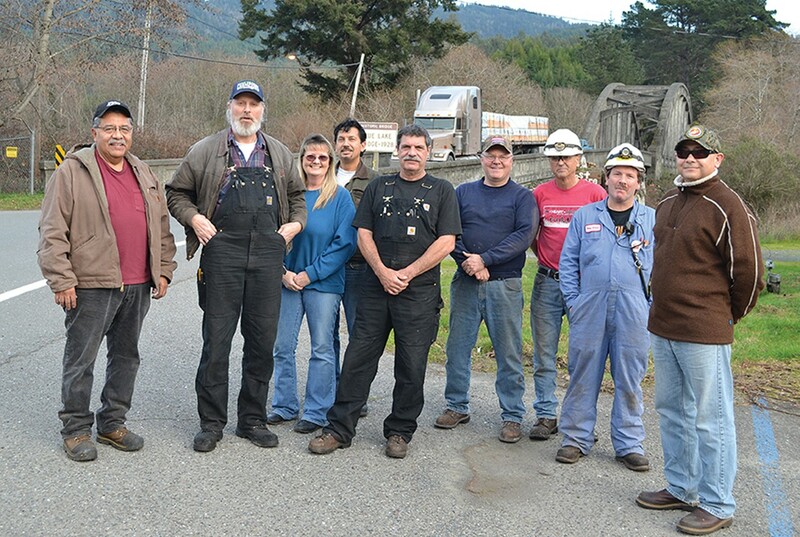 A handful of workers, however, gathered by the side of the road for a photograph. Combined, the nine of them had spent more than two centuries working at that mill just southeast of Blue Lake. Some were laughing, joshing around like this was one of those old-time company picnics out at Camp Bauer — except it was anything but. "I think we're still in shock," said lumber wrapper Cindy Box, 58, who's worked at the mill since she was 19. The mill would be closing Feb. 5 — forever, as far as these workers knew, and they were among the 106 employees soon to be out of a job. So their laughter was edged with a what-do-we-do-now giddiness. Perhaps also relief: The mill had been on the decline for at least five years, maybe 10, depending on how you looked at it. There was something more bringing out the laughter and smiles — a natural warmth and familiarity that comes from working side-by-side with the same people 10 hours a day, four days a week, for 10, 15, even 40 years. "It's like family," Box said. "You're working with people who are like your brothers." Then she laughed when someone pointed out that she had, in fact, over the years, worked with her three brothers ... and her sister and her nephew and her dad and her son and her son's dad. Not to mention that her mom, Arlene Box, ran the Korbel post office for 28 years. Now the mill family was breaking up, and everybody would be scattered to the wind. This isn't the first time the mill at Korbel shut down. It had steadily grown since 1884, when the Korbel brothers — yes, the Bohemia-born, Sonoma County-transplanted vineyard developers — opened it to produce wood for their barrels. Through the 1910s and '20s, the mill and its company town flourished. A new 40-room hotel with a tennis court, billiard room and more drew in tourists, and nearby Camp Bauer became known as "one of the most beautiful picnic grounds in the state," according to a story in the Dec. 28, 1912, Blue Lake Advocate, which elaborated: "At Camp Bauer you will find a dance platform shaded by the pretty maple pepperwood trees, tables for picnickers who bring their lunches and plan on a day beneath the maples, swings for children and a swimming pool with plenty of water in the summer time which makes swimming an ideal pleasure." After the 1929 stock market crash, lumber demand decreased and the mill sputtered to a halt by 1933. It stayed shut, only starting up again in 1943 after its owners reorganized, gained financing and spent several years remodeling the abandoned site. Humboldt's mills boomed post-World War II, as incomes increased and people built more houses, according to a report by Humboldt State University professor Steven Hackett, who writes that "lumber production in Humboldt County nearly doubled from 1949 to its peak in 1959." In the 1950s, one out of two working people was employed in the lumber industry. But by the 1960s — "before most environmental regulations were put in place" — the services sector began to grow, Hackett notes, and while lumber production remained high, the industry lost its dominance. And that trend away from manufacturing and toward retail and services has continued. Improvements in manufacturing technology, environmental regulations, recessions and other factors have contributed to lumber job losses. The recession years of 2008 and 2009 were especially tough and the industry is still recovering, says Neal Ewald, Green Diamond's senior vice president for California operations. "Housing starts just now are peaking at over a million, and were below 500,000 a few years ago," Ewald says. There've been other impacts specific to the redwood market. Over the past decade or so, redwood decking has lost market share to composite products. Concurrently, there's been a shift in the way lumber is sold, with successful producers now selling directly to big-box stores, like Home Depot, instead of through a bunch of small distributors. And Humboldt Redwood Co. beat California Redwood Co. to the big-box prize by investing millions to upgrade its mill facilities and add more shifts, and by re-tuning its marketing strategy. Ewald says Green Diamond had changed its business strategy to focus on its core business — producing redwood and Douglas fir timber. But he admits that subsidiary California Redwood Co. didn't make the right moves with regard to redwood lumber sales and distribution strategies. "We did not take advantage of opportunities that would have provided better market access," he says. "This limited our ability to access the big-box stores that were gaining an increasing market share of the lumber sales. This was especially true as we pulled out of the economic slump of [2008 and 2009]." 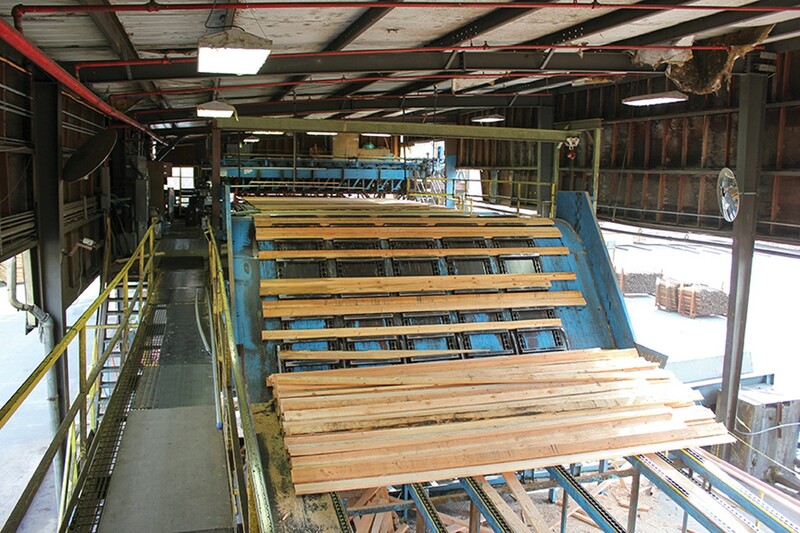 Soon California Redwood Co. found it unprofitable to keep selling milled redwood to those smaller lumberyards throughout California and Oregon — Pierson's, Do It Best, Myrtletown and the like — and, in May 2014, the company announced it would quit milling redwood and focus strictly on Douglas fir. But the Korbel mill is a redwood mill — it can't efficiently manufacture Douglas fir lumber the way a Douglas fir-specific mill can. It's too big, too slow and requires a lot of people to run it, says Bill Highsmith, California Redwood Co.'s vice president of manufacturing. Or, as Humboldt County Economic Development Coordinator Jacqueline Debets puts it, "That Korbel Mill is a Mack truck, and what they need is a Toyota." Making it viable, says Highsmith, would require heavy investment. By October, word was out that the mill was for sale. In December, the company announced it was shutting it down. And now the mill is shut, with a few employees remaining a couple more weeks to clean up the machines and handle remaining inventory. 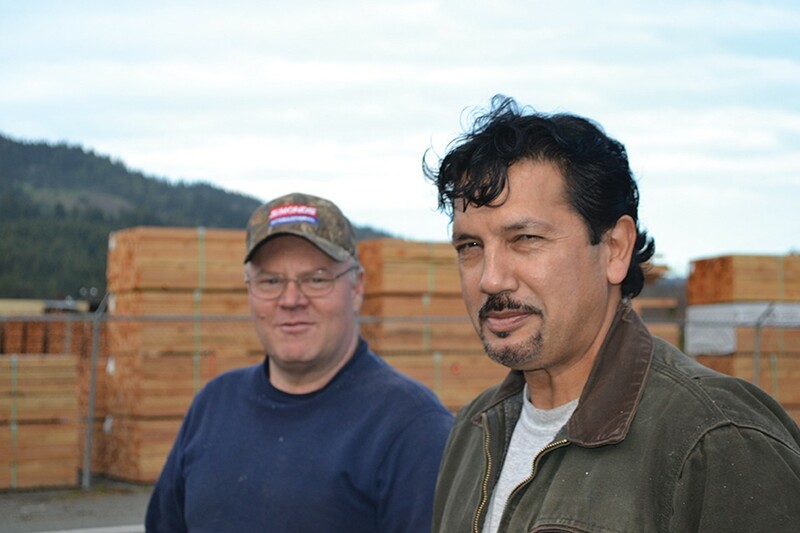 "We are very good at managing our timberlands to produce redwood and Douglas fir timber while protecting the fish and wildlife resources," says Ewald. Green Diamond will continue to harvest the same amount of timber, he adds, and sell it to local sawmills including Humboldt Redwood Co., Arcata Lumber, Mad River Lumber, Schmidbauer Lumber, Sierra Pacific Industries, and to mills in southwest Oregon and Trinity County. Debets says this consolidation and redistribution of tasks — this streamlining — won't diminish Humboldt's importance in the redwood market. "The value for redwood in the consumer's mind is growing," she says. "That's what we need to focus on. Redwood is something we're good at growing here, and we want to make sure the world values that for the specialty product it is." There will be fewer jobs — but that's not a new story. Since 1965, she says, the number of people working in lumber manufacturing in Humboldt County has gone from 11,500 to around 3,000. Mills have been shutting down in droves for decades. And right now we have a new round of displaced lumbermen and lumberwomen trying to rebound and figure out what to do next. Korbel's employees sensed for weeks, maybe years, that the mill might not make it. And so in its final days they were dealing not only with the shock that now it was really happening, but in some cases also recovering from the long, bumpy descent: investments in new equipment; layoffs; rumors of layoffs; closure of a sister mill; more equipment upgrades; rumors the mill was for sale, then news that it was not — and then news that it was; rumors of a buyer who would save them; a visit from a potential buyer; news that there was, alas, no buyer; the final layoff notice; the job fairs, promises of retraining and excitement over a fresh start mixed with financial fears. "It's been a real rollercoaster," says bypass operator Ed Moreno, 48, who's been there 17 years. Rob Dare, a saw filer who's been at Korbel nearly 41 years, says the downward spiral really began the day California Redwood Co. took over the mill. "Personally, I think they had their minds made up to get rid of it," he says. "From that time on, they were not investing money back into the mill. And we started patching things together. The 30 years before that, it was invest, invest, invest. Then they let it go. It was sad. We were always on top, excited to go to work. Then it got depressing." Over the years, some say, the mill also lost that family feel it had under Simpson. But this was happening at other mills, too. "I was just talking to my dad the other day about how it was when the owner of Eel River Sawmills was still alive," says Moreno. His dad was a grader there. "Every payday, the owner would pass out about $10 in silver dollars. Those old timers that ran these businesses, they're all gone, and the grandkids that are running them now ... it seems to me, there's been a disconnect from those old timers who really cared about their employees." Dare, who was 18 when he started at Korbel right out of Arcata High School, says the old guys at the mill — including his dad, a scaler — pretty much raised him. He recalls one beloved mill manager in particular: Henri Appy. "He was a big shot," says Dare. "He could walk through the mill and it was like he was everybody's best friend. He knew everybody's names." When their kids were little, says Dare, he and his wife took them to the company picnics and baseball games and generally immersed the family in the "home atmosphere" the mill bosses engendered. Willy Ward, a 53-year-old sawyer who's been at Korbel 16 years, says his earliest memories are of being at Camp Bauer in Korbel. He was born in Arcata, and his great aunt Thelma Gray "owned half of Blue Lake," including the Logger Bar. Meanwhile, his grandmother Ivadell Williams was a traveling mill camp cook who ended up working as a housekeeper in the Korbel Hotel in the 1940s. "Anyone with a connection to Simpson went to the annual picnics, so everyone went," says Ward. "There were footraces and other games. They'd put a 'fishing hole' behind the tent, and you could pull up a prize." It was the same way in Scotia, says Ward. He was 5 when his family moved down there. His stepdad worked at Pacific Lumber Co. and, in time, so did Ward. "The Monday after I graduated from Fortuna High School, I had to report to work at Scotia — because I was a mill kid." Later, after a stint of building houses, Ward ended up at Eel River Sawmills where he says he was lucky to learn from the "old guys ... in the twilight of their careers." In 1998, after layoffs at Eel River, Ward got hired on at Korbel. While these older mill employees regret that the atmosphere became more "corporate" after California Redwood Co. took over Korbel, they don't seem bitter about the closure. "I was disappointed when they announced we were actually closing," says Dare. "And I wanted to tell somebody from Simpson how much I appreciated what they'd done for me all the years. It's been good money, good insurance, and I've been able to raise a good, healthy family, buy cars, go to the lake and do what I want. ... I didn't feel they were getting that message, and I felt they deserved it — everything had been so negative, because people were upset." Dare, Ward and others also speak highly of how the company handled the closure, doing everything within its means to help employees transition to something else. 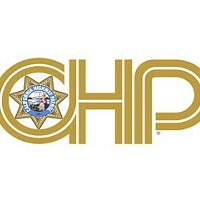 In addition to severance pay — one week's salary for every year worked at Korbel — the company brought in county and state employment and social services representatives to survey employees to find out their needs and interests, and to explain, in groups and one-on-one, such things as unemployment, Covered California health insurance and other safety net programs. They also explained retraining, relocation and retirement options, and how to pursue them. The company held résumé and interview workshops and hosted a number of job fairs attended by a range of businesses. 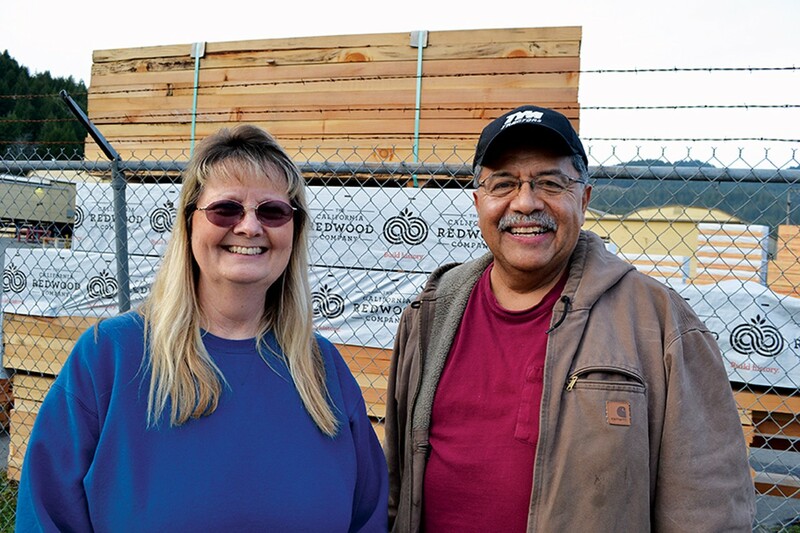 Connie Lorenzo, with the Humboldt County Employment Training Division, says the company's willingness to help its soon-to-be displaced employees is typical of the timber industry. And she says the Korbel employees — 93 union production workers and 13 non-union — have been receptive to the help. The help is considerable: The union — International Association of Machinist and Aerospace Workers — is offering its members reduced insurance rates while they look for work, and will help those wanting to stay in the mill business find a new job and relocate (because most mill jobs are out of the area). The county, meanwhile, has asked the state for an additional $492,000 in Workforce Investment Act funds to assist Korbel's displaced workers. The funds each person will get depend on actual need, Lorenzo says; for example, one person might just need $3,600 to relocate, while another might need $12,000 to go back to school. Lorenzo says she figures about 15 Korbel employees might retire. A few others, like Dare, are hoping to find work at another sawmill, though local mill jobs are scarce. And many want to learn something new. Dare, who will be 60 on Feb. 23, says he's always liked working, and he loves being a filer. "It's challenging all the time," he says. "To me, I'm making the lumber: The saw has to be flat and straight and has to run 10 hours, and stay sharp. That's my responsibility. I'm proud of it. And I've never gotten bored with it. There's technique to learning how to bench, how to straighten the saws, how to line up the machines." 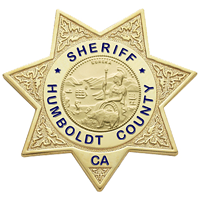 In the past couple of weeks, Dare has been excited about a promising job prospect at Humboldt Redwood Co. He'd gone down and talked with one of the managers, who reminded him of the beloved Henri Appy. He'd gotten a good feeling about the place — it's like the old Simpson Timber Co., he says. If a mill job doesn't come, he says he'll learn something new, though he's worried it won't have the good benefits and insurance his old mill job had. Lorenzo says at least 50 of Korbel's displaced workers are talking about retraining, and that's not surprising. "In the past, we've had people who come out of the lumber industry and entirely change their career, and become a registered nurse or something like that," she says. "What we're finding with a lot of these clients is, they may have had an interest that they put aside when they got into the timber industry, and they just kept working timber because they were making good money." Some Korbel employees are looking into truck driving school, and others at learning to repair big rigs or motorcycles, or at becoming accountants or getting a degree in administration of justice. Some who did electrical work at the mill are considering getting an electrician's certification — and there's "huge demand" for electricians, says Debets. Ward, the expert sawyer with an upbeat personality and a seemingly encyclopedic mind, is still deciding what to do next. Maybe he'll go back to college and learn computer science — "I love that stuff," he says. Or maybe he'll become a financial advisor, which he was eyeing as a kid. He's become sort of a guru, he says, of the informal investment club he and others formed at Korbel. "I've been in there with my 401K money, moving money since 1998," he says. "My returns beat any stockbroker I know." His plan is to make more than his $24-an-hour sawyer pay (among the best-paid positions at Korbel, he says). In the meantime, he'll get extended unemployment benefits if he's in school. His wife works as a bookkeeper, and they own their own house, which he built. But they do have two kids in college, so finances are still a worry. Moreno, who started at $10 an hour at Korbel and now makes almost $20, still has kids at home and a mortgage on the house he and his wife bought three years ago. He admits he's nervous about what's ahead. "It's hard to sleep at night," he says. And the prospects at the job fairs the company hosted were deflating. Kokatat was paying $9-something an hour, he says. Wing Inflatables soon will be hiring new workers — for $10-an-hour and on-the-job training. "Sierra Pacific [Industries] was offering probably the best pay, $14 to $15 an hour, and only had about three labor positions open," he says. But Moreno, who also worked at Blue Lake Forest Products, doesn't want another mill job — it's too uncertain. And he doesn't want to return to police work, which he did for a while. He likes the idea of getting a bachelor's degree in criminal justice, or training to be an MRI or X-ray technician. Whatever he does, he says, he'll be dedicated to it. That's how he was raised, and it was reinforced in his 10 years with the Marine Corps. "I've missed probably only five days of work total in my whole life of work," he says — and that includes his first job, sweeping the Dinsmore store parking lot for a silver dollar when he was in kindergarten. Debets says the Korbel workers shouldn't have too much trouble finding work, possibly even higher-paying work if they retrain to work in some of the growing fields, such as sales and customer service, and medical services. "The people there are the best of the best," she says. "These are very good workers. We do have employers here that are going to hire them." And what will become of the mill? Ewald, the Green Diamond VP, says the company is still actively trying to sell it. Without offering any specifics, he says that if the mill doesn't sell the company will review its options. But to run it as a mill again, he says, would require "a substantial infusion of capital. "Potential buyers may see additional opportunities," Ewald says. "The property is close to a deep-water port, is surrounded by growing timber from four counties, and is zoned for industrial use." That does sound like an ad for the poor beast. Perhaps somebody will buy it — one rumor paints a scenario in which another lumber company waits until everyone's laid off, snaps up the mill, upgrades it and then hires people back on the non-union cheap. Or perhaps the mill is in for another long slumber. 1882 — Brothers Anton, Francis and Joseph Korbel, of Sonoma County, buy land in the area then known as "North Fork." 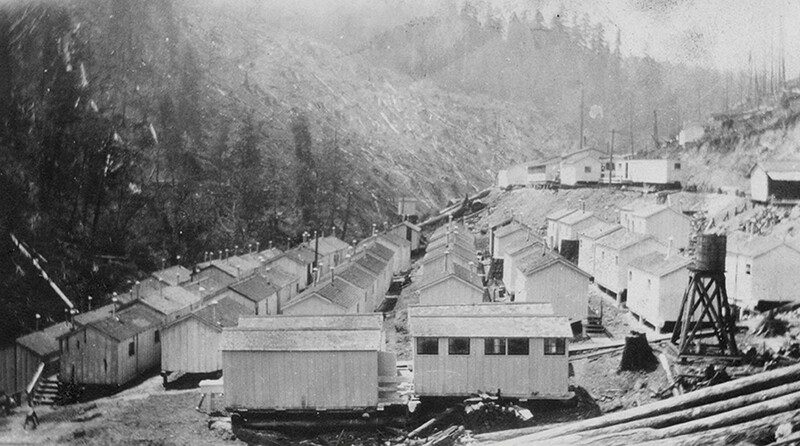 1883 — The Humboldt Lumber Mill Co. (the Korbels and E.L. Cutten) files articles of incorporation. Sawmill construction begins. 1884 — The mill starts production. The Korbels buy the Arcata and Mad River Railroad and extend it 6 miles to the mill. 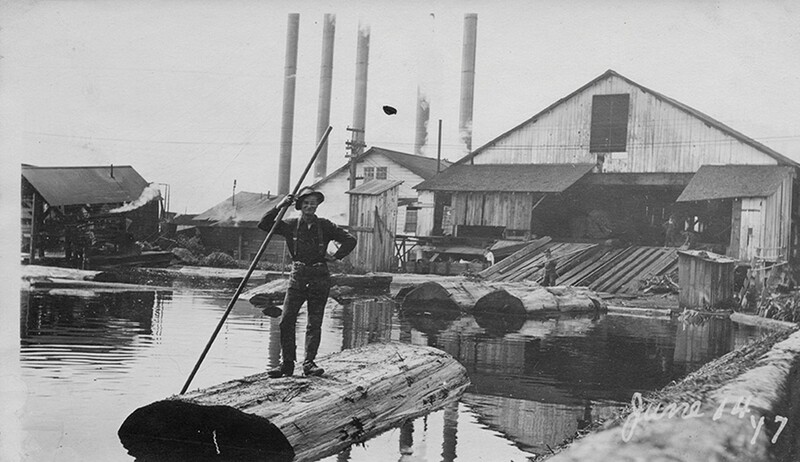 1886 — The mill becomes the first in Humboldt to use a kiln to dry lumber. 1891 — The Korbel Post Office is established and the town of North Fork is renamed Korbel. 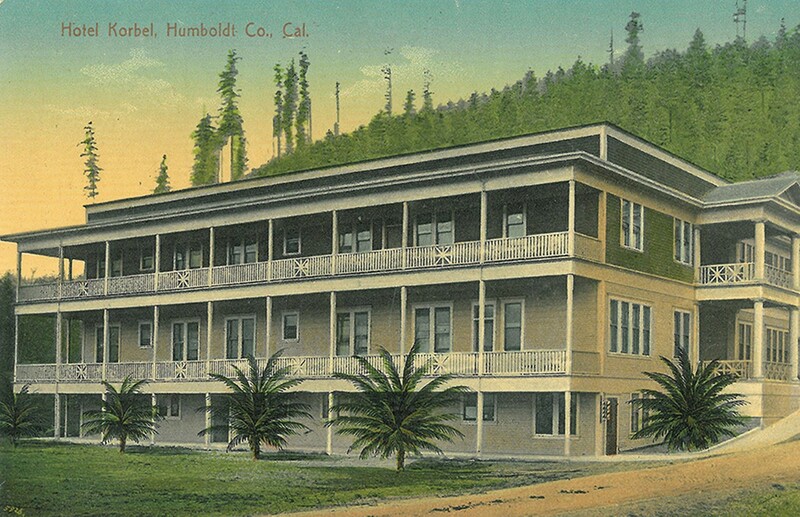 1903 — The Korbel family sells the mill, railroad and other Humboldt holdings to Riverside Lumber Co. and Charles Nelson Steamship Co., who consolidate as the Northern Redwood Lumber Co.
1908 — The Hotel Korbel is built. 1933 — The Korbel Mill shuts down in the Great Depression. 1943 — The mill reopens after upgrades and refinancing. 1950-1952 — The mill gets new equipment, goes from steam to electric, increases lumber production and reduces the workforce. 1954 — Simpson Redwood Co. forms. 1956 — Simpson buys Northern Redwood Lumber Co. and begins tearing down the town to enlarge the Korbel Mill; State Route 299 is built, bypassing Korbel. 1959 — The Hotel Korbel is torn down. 1960s — Most of the rest of the company homes come down. 1980 — The large headrig used to saw large, old-growth logs is removed. The log quad, for sawing multiple, smaller young-growth logs, is installed. 2006 — Simpson's spinoff, Green Diamond Resource Co., begins managing its timberlands. 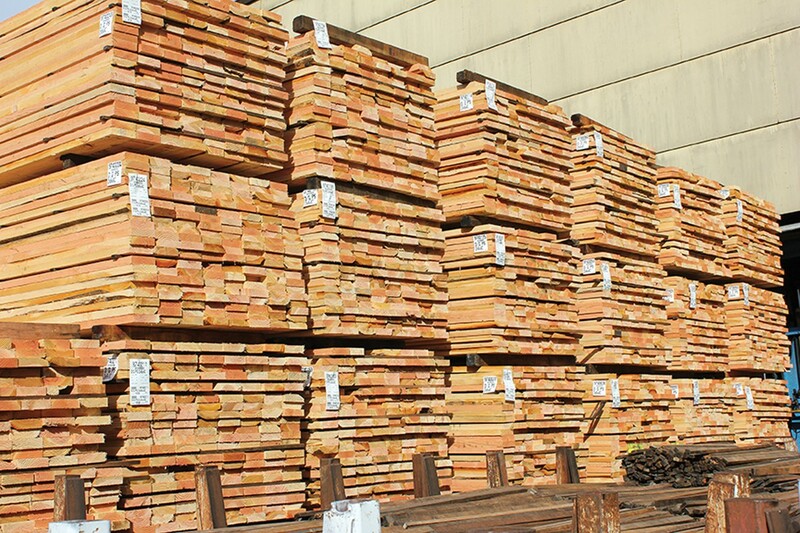 Green Diamond subsidiary California Redwood Co. takes over its lumber mills. 2008 — There are layoffs and shift reductions at Korbel Mill and Brainard remanufacturing site as recession hits and new-home construction slows. 2009 — California Redwood Co. closes its Orick mill and lays off more employees at Korbel and Brainard. 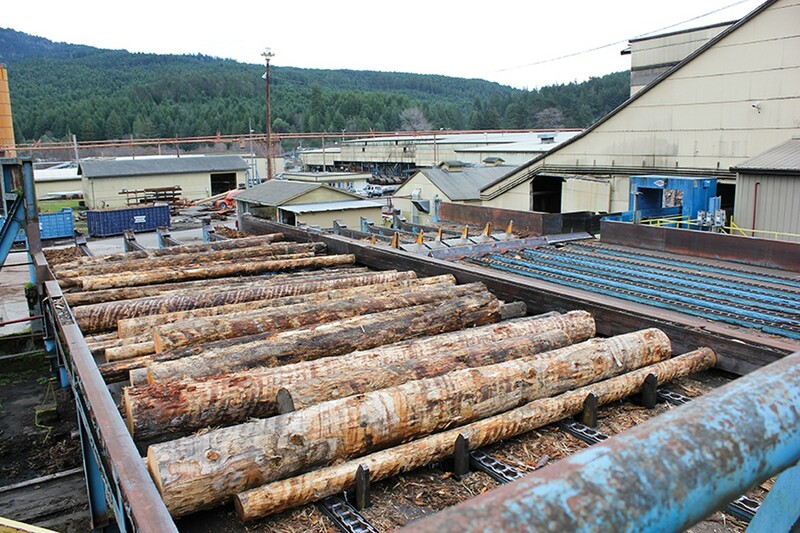 2013 — California Redwood Co. gives 155 employees a 60-day layoff notice but denies rumors the mill is for sale. Citing a huge drop in redwood sales, the company reduces its Korbel operation to one shift and lays off 45 workers. 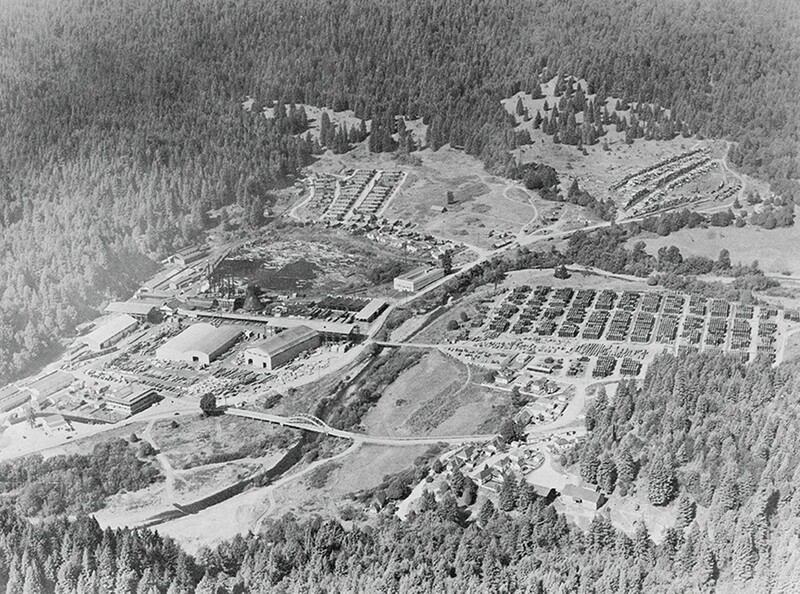 2014 — In May, the Korbel Mill stops milling redwood and focuses mainly on Douglas fir. 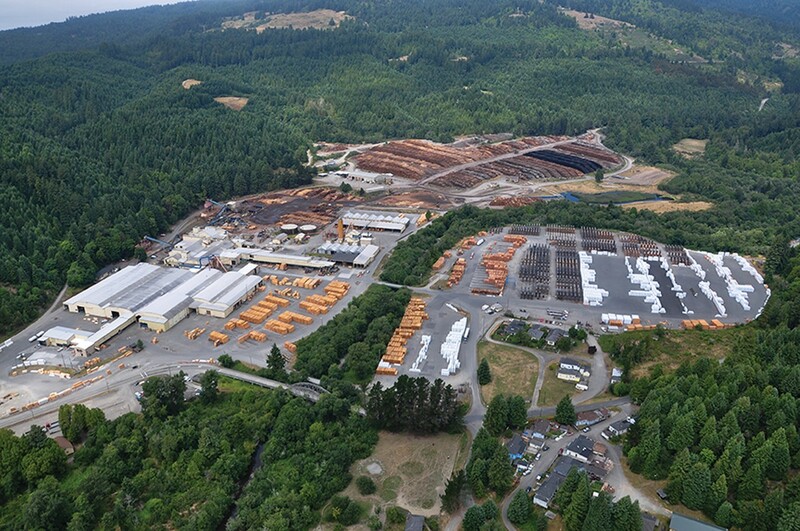 The company sells its redwood remanufacturing site (where high-grade lumber is finished) in Ukiah in May, the one in Woodland in August and shuts down the Brainard one in November. In October, California Redwood Co. announces that the Korbel Mill is for sale. In December, the company announces it will close the Korbel Mill in February. 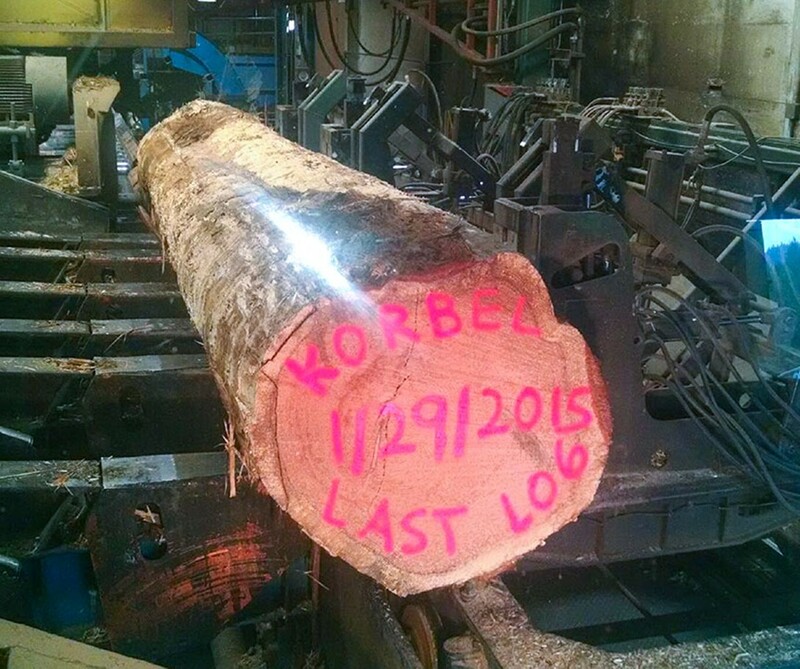 2015 — On Feb. 5, the Korbel mill closes.